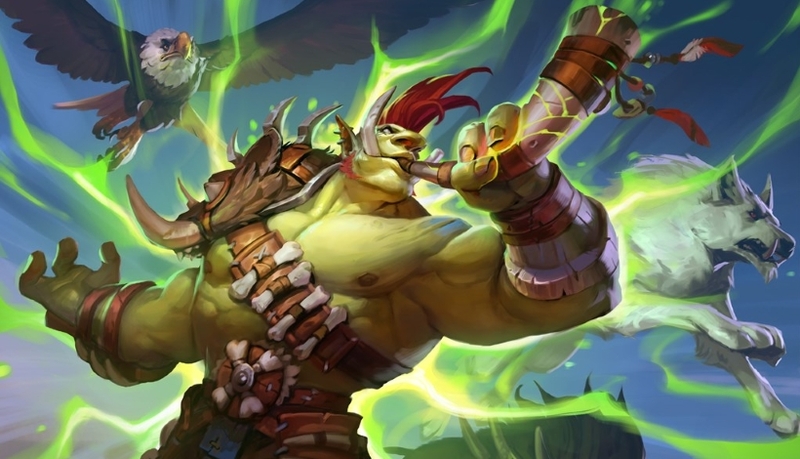 Our Beast Hunter deck list guide features the best Rise of Shadows deck list for Season 61 of Hearthstone (April 2019). Our Beast Hunter guide also contains Mulligan advice, card combos and strategy tips. Beast - or Midrange - Hunter is a deck that's been popular in Hearthstone since time immemorial. It has the power to take a controlling position against more aggressive opponents, yet can quickly switch to a more aggressive stance of its own when you need to finish a game against slower opponents who threaten to starve you of cards. Suffice to say, a broad understanding of the state of the current metagame will go a long way when it comes to winning more games with this archetype. In the next of our Rastakhan deck guides, we'll walk you through the basics of playing the very latest version of Beast Hunter, provide you with some in-depth strategy advice, and also give you some pointers on how to Mulligan correctly in an uncertain meta. Finally, we run through all of the most important card combos that exist in this version, before highlighting the core cards along with substitute advice. Here’s a deck list for Beast Hunter that’s been created for the launch of the Rise of Shadows set, and is subject to a lot of change in the coming days and weeks. The rest of this guide will be updated once the meta has settled down and we know what the most popular decks are, and what the strongest versions of those decks are. This is the strongest version of Beast Hunter that's seeing play at the current stage of the Rastakhan meta. We'll be watching as things settle more over the coming weeks to see if anything drastic changes. Taking advantage of beast synergy, weapons and minion buffs the Beast Hunter aims to steadily build pressure over the game with a well-curved deck full of value-oriented cards. You should be able to find a strong play on each turn to build a powerful board, whittle down your opponent over time, and finish them off with big late game minions or burst damage from Kill Command. Early game: Play out your early game minions and take efficient trades where possible. Cards such as Crackling Razormaw can get extra value out of your early game Beasts with some fortuitous Adapt buffs, Springpaw can be used to create the kind of fuel that can seriously boost up your Scavenging Hyena. If you’re falling behind then Flanking Strike provides nice removal and board presence at the same time. Late game: Deathstalker Rexxar allows you to dish out some welcome damage against the opponent's board, and then generate beasts of your own devising thanks to a new Hero Power. You also have a pair of Savannah Highmanes to play with in the latest version of the deck. 3. Adapt effects you’ll want to look for off Crackling Razormaw include Crackling Shield, Living Spores, Massive and Rocky Carapace. 4. If you make it to the Deathstalker Rexxar play with your health intact, you'll be in a great position to hold them at bay and claim the match. 2. You’ll want to look for a few different Adapt effects off Crackling Razormaw, such as Crackling Shield, Flaming Claws, Living Spores, Liquid Membrane and Volcanic Might. 3. Flanking Strike can be used as a huge tempo swing and put you in a dominant position. 1. Dire Mole: A solid opening play that can be empowered considerably with a lucky Crackling Razormaw play. 2. Crackling Razormaw: The perfect follow up to your one-drop minions as it can help them trade up against stronger cards. 3. Springpaw: As this has Rush, you can attack enemy minions with it the moment it’s played to stay in control of the early game. 4. Animal Companion: It's hard to get a bad option off this spell when playing this deck, especially if you've had a solid pair of opening turns to build board presence with. 5. Candleshot: Great for chipping away at minor minions and giving aggro opponent's a real problem to deal with. With an influx of new cards comes a whole new load of synergies to think about. Beast Hunter may be a bit of an old dog at this point, but it's certainly picked up a few new tricks with the latest expansion. - All other Beasts on the board gain an extra point of Attack as long as Timber Wolf remains out in play. - Candleshot pair with a Hunter's Mark cast can nullify even the biggest threats the opponent places in front of you. - Scavenging Hyena gains an extra +2 / +1 of stats whenever a friendly Beast minion dies. You can boost this character up quite quickly using Springpaw and its associated token. - Dire Frenzy can be used to enhance even the flimsiest of minions, and then add a collection of them to your remaining deck pile. - Master’s Call offers some serious card draw to Beast Hunter. As all of the minions you run in the deck are Beasts, that means you’ll always add three cards to your hand for just three Mana. - As long as Tundra Rhino is on the board and unsilenced, it'll enable all subsequently summoned Beast minions to have the Charge mechanic. Dire Mole: Three health means it should stick around for a couple of turns and you can Adapt it with Crackling Razormaw on turn two. Crackling Razormaw: With a well-timed Adapt you can gain a huge advantage over your opponent. Headhunter’s Hatchet: A excellent weapon in this deck that steals the spot usually reserved for Eaglehorn Bow due to all the Beast synergy. Revenge of the Wild: You can make a massive tempo play with this by bringing back all the Beast minions you’ve used to trade into your opponent’s creatures in a single turn. Master’s Call: Gives the deck a powerful way to stay in the game if you’re running low on resources by drawing three more Beast creatures. Bittertide Hydra: The drawback can be dangerous if your opponent manages to exploit it fully, but it also represents a lot of potential damage if they have no way to deal with it properly when played. Deathstalker Rexxar: This hero card has a strong board clear effect when played and also allows you to generate an infinite army of stitched-together minions with the new Build-A-Beast hero power. @Adder Losing my mind over launch. It was in another version of the Beast Hunter, not Spark's. I will tweak that now - thanks!